The number one request we have gotten after launch has been about accepting Paypal.com payments. We just launched the ability to pre-fund accounts using Paypal.com directly. Please note to do this you have to navigate to My Account > My Settings > Billing > Add Funds. We hope to have Paypal.com payments in the shopping cart in the next few weeks, but for now adding funds will allow people who only use Paypal.com to get in and start using the system! For the entire month of November, NameBright is offering $4.99 .COM domain registrations. This applies to all accounts, without limits. Register one domain. Register a thousand domains. It is the same low price. No coupon code needed. You can get even lower pricing with a funded account. If you pre-fund your account the price will be $4.58 per new .com registration during November! This promotion does not apply to transfers or renewals. It is for new domain registrations only. 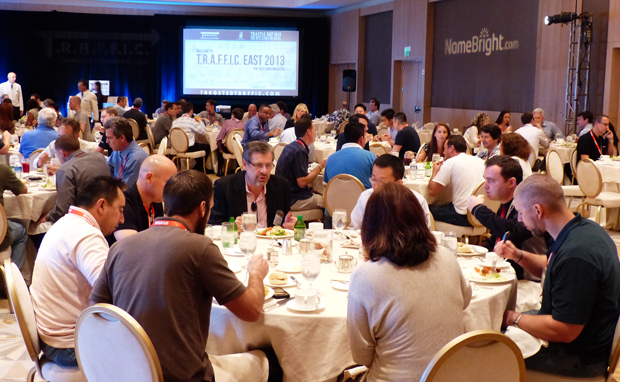 Attached is a photo from NameBright’s sponsorship of TRAFFIC East 2013! See top-right of the picture. The conference was great, good meeting everyone and getting some great ideas on how we can improve our service for domainers!! Our re-launch went amazing. Everything from our first public customer to a few bulk transfers and registrations. We could not be more than happy at this point. If you have any suggestions or comments or feedback we would love to hear it! Our team is eager to please and a lot more nimble than your old registrar! NameBright.com (http://www.NameBright.com) recently announced the public launch of its next generation domain registration platform. This domain registration platform helps people buy and manage Internet domain names. NameBright.com’s new platform has been in development for over five years and provides advanced features and functionality not offered by other domain name registrars; including domain history, free e-mail forwarding, category-based e-mail accounts, free privacy protection, cutting edge security settings, and a whole lot more.